The Tuscarora are an American Indian tribe originally in North Carolina, which moved north to New York, and then partially into Canada. Their name derives from their use of hemp, meaning "hemp gatherers." Encountering European settlers in the seventeenth century, the Tuscarora maintained harmonious relationships with them for half a century. They were willing to share with them what they had. However, the settlers not only brought diseases which reduced the Tuscarora population, they also began to take their lands and kidnapped and sold into slavery their women and children. Seeing no way to deal with the situation other than violence, the southern group of Tuscarora enlisted the help of other native Algonquian tribes and an uprising took place, leading to the Tuscarora War. The outcome was that the Tuscarora became the first native people to be dispossessed of their land during colonization, and they walked north to New York in the early eighteenth century to join the Iroquois Confederacy (Haudenonsaunee). Accepted by the confederacy, they have been part of the Six Nations ever since, together with the Cayuga, Mohawk, Oneida, Onondaga, and Seneca. The Iroquois, too, faced problems as the American Revolutionary War came to their region. After the war, those who had sided with the British moved north to Canada, where they were given land. Tuscarora live on that reserve today. A substantial portion of Tuscaroras joined the Oneidas in supporting the Americans, however, and they remained on land in New York. Today, Tuscarora live in Canada and New York. Despite their difficult past, they continue as a sovereign nation with the Haudenosaunee government including chiefs, clan mothers, and faithkeepers. They maintain their culture and traditions, such as playing the traditional form of lacrosse called "stickball," traditionally used as a method of setting inter-tribal disputes without the violence of war. The Tuscarora originally inhabited the coastal plain of what became North Carolina. really better to us than we have been to them, as they always freely give us of their victuals at their quarters, while we let them walk by our doors hungry, and do not often relieve them. We look upon them with disdain and scorn, and think them little better than beasts in human form; while with all our religion and education, we possess more moral deformities and vices than these people do (Lawson 1718). However, the arrival of the settlers was ultimately disastrous for the aboriginal inhabitants of North Carolina. There were two primary contingents of Tuscarora, a Northern group led by Chief Tom Blunt and a Southern group led by Chief Hancock. Chief Blunt occupied the area around what is present-day Bertie County on the Roanoke River; Chief Hancock was closer to New Bern, North Carolina, occupying the area south of the Pamplico River (now the Pamlico River). While Chief Blunt became close friends with the Blount family of the Bertie region, Chief Hancock found his villages raided and his people frequently kidnapped and sold into slavery. Both groups were heavily impacted by the introduction of European diseases, and both were rapidly having their lands stolen by the encroaching settlers. Ultimately, Chief Hancock felt there was no alternative but to attack the settlers. The Southern Tuscarora, led by Chief Hancock, worked in conjunction with local Algonquian tribes, including the Pamlico, the Coree, the Mattamuskeet, and the Matchepungoes, to attack the settlers in a wide range of locations in a short time period. 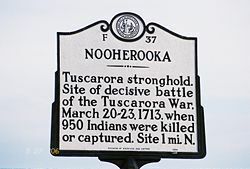 The first attacks began on September 22, 1711, beginning the Tuscarora War. Governor Edward Hyde called out the militia of North Carolina and attacked the Southern Tuscarora and other tribes in Craven County at Fort Narhantes on the banks of the Neuse River in 1712. Many were killed and prisoners, largely women and children, were sold into slavery. Chief Blunt was then offered the chance to control the entire Tuscarora tribe if he assisted the settlers in putting down Chief Hancock. Chief Blunt was able to capture Chief Hancock, and the settlers executed him in 1712. In 1713, the Southern Tuscaroras lost Fort Neoheroka, located in Greene County, with over a thousand killed or captured (Norton et al, 2007). It was at this point that the majority of the Southern Tuscarora began migrating to New York to escape the settlers in North Carolina. The remaining Tuscarora signed a treaty with the settlers in June 1718 granting them a tract of land on the Roanoke River in what is now Bertie County. This was the area already occupied by Tom Blunt, who had taken on the name Blount and was recognized by the Legislature of North Carolina as King Tom Blount. The remaining Southern Tuscarora were removed from their homes on the Pamlico River and made to move to Bertie. In 1722, Bertie County was chartered, and over the next several decades the remaining Tuscorara lands were continually diminished, sold off in deals that were frequently designed to take advantage of the American Indians. After the Tuscarora War most of the tribe removed from North Carolina to New York to become the sixth nation of the Iroquois, settling near the Oneidas on land given them by the Seneca nation. The migration period took approximately 90 years to complete. Some lived in Pennsylvania for a time before moving to New York. Others, who had not been involved in the uprisings, were permitted to remain in their villages in North Carolina, but later most joined the tribe in New York. To this day there are still many people in North Carolina and other states who claim Tuscarora descent. A substantial portion of the Tuscaroras sided with the Oneida nation against the rest of the League of the Six Nations by fighting for the U.S. government during the American Revolutionary War. Those that remained allies of the Crown later followed Joseph Brant into Ontario, Canada. In 1803, the final contingent of the Tuscarora migrated to New York to join the tribe at their reservation in Niagara County, under a treaty directed by Thomas Jefferson. By 1804, only a few scattered families remained in North Carolina. In 1831, the Tuscarora sold the remaining rights to their lands in North Carolina, which had been reduced from their original 56,000 acres (227 km²) to a mere 2000 acres (8 km²). The Tuscarora originated in the area of the Atlantic coastal plain that became North Carolina. Their lifestyle there included hunting and gathering, as well as some farming. Fishing contributed significantly to their diet, as they could fish both in the rivers and gather shellfish and other fish from the ocean (Waldman 2006). 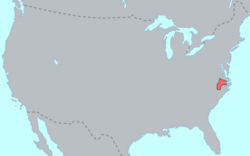 In the early eighteenth century, after the end of the Tuscarora War, most of the tribe removed from North Carolina to New York to become the sixth nation of the Iroquois Confederacy. The Tuscarora adoped Gayanashagowa, the Great Law of Peace—the founding constitution. This established the government of the nations, the duties and procedures of chiefs and clan mothers, and methods of resolving disputes among member nations. It is codified with the help of a memory device in the form of special beads called wampum that have inherent spiritual value. At that time they adopted more aspects of the Iroquois culture, participating in Haudenosaunee rituals and living in long houses—long lodges that were extended as the families grew, also used for ceremonies and council meetings. Their language also evolved as a branch of the Iroquoian languages. The men also adopted the use of gustoweh, feathered caps constructed with turkey feathers. Each of the tribes in the Iroquois Nation had a different style of gustoweh. The Tuscarora style had no upright eagle feathers, whereas those of the other nations had one, two, or three such feathers in addition to the turkey feathers. The Tuscarora language, known as Skarohreh is a member of the Northern branch of the Iroquoian languages. It is spoken in southern Ontario, Canada, and northwestern New York around Niagara Falls, in the United States. The original homeland of the Tuscarora was in eastern North Carolina, in and around the Goldsboro, Kinston, and Smithfield areas, and some, though few, still live in this region. The name Tuscarora comes from the tribe's name and means "hemp people," after the Indian hemp or milkweed that they use in many aspects of their society. Skarureh refers to the long shirt worn as part of the men's regalia, hence "long shirt people." The Tuscarora language can appear complex to those unfamiliar with it, more in terms of the grammar than the sound system. Many ideas can be expressed in a single word, and most words involve several components that must be considered before speaking (or writing). It is written using mostly symbols from the Roman alphabet, with some variations, additions, and diacritics. Tuscarora is a living but severely endangered language. As of the mid-1970s, only about 52 people spoke the language on the Tuscarora Reservation (Lewiston, New York) and the Six Nations of the Grand River First Nation (near Brantford, Ontario). The Tuscarora School in Lewiston has striven to keep the language alive, teaching children from pre-kindergarten to sixth grade. Despite this, only a dozen speakers remained in the 1990s, all of whom are older adults. The Iroquois believed in a supreme spirit, Orenda, the "Great Spirit," from whom all other spirits were derived. Legends tell of Atahensic (also called Ataensic), the sky goddess, who fell to the earth at the time of creation and was carried down to the land by the wings of birds. After her fall from the sky she gave birth to Hahgwehdiyu and Hahgwehdaetgah, twin sons. She died in childbirth and was considered the goddess of pregnancy, fertility, and feminine skills. Hahgwehdiyu put a plant into his mothers lifeless body and from it grew maize as a gift to humankind. Hahgwehdaetgah his twin was an evil spirit. The Tuscarora, together all Haudenosaunee, believed that winter is a time of death in which Mother Earth goes into a long slumber and many plants die, but when spring arrives and nature begins to flourish, she has woken up and given life once again. Celebration of the maple sap and strawberries as well as corn planting were considered spiritual in nature. Also, in the winter, there was an important eight-day festival to give thanks and to forget past wrongs (Pritzker 2000). In the early nineteenth century the teachings of Handsome Lake became popular among Tuscarora. Handsome Lake was a Seneca who taught about Jesus and also blended the traditional celebrations with Christian-style confessions of sin and urged Native Americans to stay away from alcohol. His teachings eventually were incorporated into the Longhouse religion, which continues to have followers today. 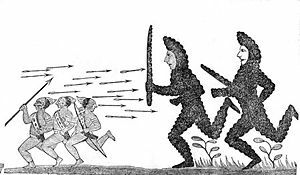 The Tuscarora were the first native people to be dispossessed of their land during colonization, and they walked north in the early eighteenth century to join the Haudenosaunee. Accepted into the Iroquois Confederacy they have been part of the Six Nations ever since. Since 1927, Tuscarora have joined the annual Border Crossing Celebration founded by Chief Clinton Rickard to promote the unrestricted crossings between the United States and Canada, as guaranteed in the Jay Treaty of 1794 and the Treaty of Ghent of 1814. Rickard founded the Indian Defense League of America, which sponsors the Celebration, to resist the erosion of native rights and promote their culture (Graymont 1994). Today the Tuscarora prosper, living in the reservations of Ontario, Canada and New York state. They continue their culture and traditions, government through chiefs, clan mothers, and faithkeepers. They continue to fish in the Niagara River and play their traditional game of lacrosse (also known as "stick ball"), a part of their heritage that is far more than just a game, serving religious and social purposes as well as being played to settle inter-tribal disputes, and essential function in keeping the Six Nations of the Iroquois together (Printup and Patterson 2007). Six Nations of the Grand River is the name applied to two contiguous Indian reserves southeast of Brantford, Ontario, Canada. The original reserve was granted by Frederick Haldimand under the Haldimand Proclamation of October 1784 to Joseph Brant and his Iroquois followers in appreciation of their support for the Crown during the American Revolution. In 1785, a census showed that 1,843 Natives lived there which included 448 Mohawk, 381 Cayuga, 245 Onondaga, 162 Oneida, 129 Tuscarora, and 78 Seneca. There were also 400 from other tribes including Delawares, Nanticokes, Tutelos, and even some Creeks and Cherokees (Kelsay 1984). Joseph Brant also invited several white families to live on the grant, particularly former members of Brant's Volunteers and Butler's Rangers. Today, Six Nations of the Grand River is the most populous reserve in Canada, with a recorded population in 2001 of 21,474. The reserve has both a traditional Iroquois council of chiefs and an elected band council conforming to Canadian government requirements. The Tuscarora Reservation is an Indian reservation located in the Town of Lewiston in Niagara County, New York, United States. The population was 1,138 at the 2000 census. The reservation is a composite holding derived from land given to the tribe the Seneca, land donated by the Holland Land Company, and Trust territory held by the federal government. Graymont, Barbara. 1972. The Iroquois in the American Revolution. Syracuse, NY: Syracuse University Press. ISBN 0815600836. Graymont, Barbara (ed.). 1994. Fighting Tuscarora: The Autobiography of Chief Clinton Rickard. Syracuse, NY: Syracuse University Press. ISBN 0815601905. Hodge, Frederick Webb. 2006. Handbook Of American Indians V2: North Of Mexico Part Two. Kessinger Publishing, LLC. ISBN 1428645586. Kelsay, Isabel. 1984. Joseph Brant 1743-1780 Man of Two Worlds. Syracuse, NY: Syracuse University Press. ISBN 0815601824. Lawson, John. 2007. History of Carolina. Library Reprints. ISBN 978-0722249963. Norton, Mary Beth, Carol Sheriff, David M. Katzman, David W. Blight, and Howard Chudacoff. 2007. A People and a Nation: A History of the United States, 8th Edition. Wadsworth Publishing. ISBN 978-0618951963. Printup, Bryan, and Neil Patterson Jr. 2007. Tuscarora Nation (Images of America). Arcadia Publishing. ISBN 978-0738549538. Pritzker, Barry M. 2000. A Native American Encyclopedia: History, Culture, and Peoples. Oxford University Press. ISBN 978-0195138771. Taylor, Alan. 2006. The Divided Ground. New York, NY: Alfred A. Knopf. ISBN 0679454713. Zieber, Maureen. 2009. Gustoweh Worn by the Haudenosaunee Native American History, Suite 101. Retrieved September 23, 2011. This page was last modified on 24 December 2015, at 16:03.